To overcome many of the limitations of the linear self-starting sodium lamps and better compete with Philips' development of the single ended high voltage lamps, Osram introduced a family of single ended self-starting lamps in 1936. They exist in two versions known as the Na300U-53W and the Na500U-80W. The first number refers to the luminous flux in dekalumens and on the German Hefner lumen scale, which differs slightly from the present day international lumen. One Hefner Lumen = 0.903 Lumens. As such their luminous flux is 3000 and 5000 Hlm, which equates to approximately 2700 and 4500 lumens. The second number refers to the power consumption, 53W and 80W respectively. The letter U differentiates them from the linear versions, because of the U-shaped discharge tube. Both of the single ended lamps were also manufactured by Philips Eindhoven, under the slightly different nomenclature SO300 and SO500. They are believed to have been discontinued by both Osram and Philips prior to 1940, by which time it had become clear that the high voltage lamps were the better design. Figures S37 and S42 illustrate the construction of the Na500U-80W lamp which employs both starting aids. The Na300U-53W is identical except for the fact that the starting probe and the secondary resistance are omitted. In both ratings the discharge tube is folded into a short U-bend made from wide bore tubing. Each limb of the discharge tube contains an isolated wire, encapsulated over most of its length within a small diameter glass tube. Sometimes the wire in the tube takes the form of a finely coiled tungsten filament, and it is unclear whether or not this plays any heating role to further lower the lamp ignition voltage. The tube is pierced with a small hole near its mid-point to allow the inner space to be evacuated during lamp production. Probes extend from the distal end of each tube into the U-bend area, with a gap of approximately one centimetre between the two which forms one of the pair of locations where the discharge is first initated upon lamp starting. One of these isolated wires is brought outside the discharge tube via a third conductor in the press-seal, and is connected to the electrode at the opposite end of the tube via a high resistance. The resistor is located on the centre of the mica support disc between the two limbs of the discharge tube. The second of the isolated wires is floating inside the second limb of the discharge tube, its proximal end terminating a few millimetres from the main electrode. This gap forms the second location where a small discharge is initiated during lamp starting. In the case of the 500 Hlm lamp only, a third auxiliary electrode is sealed into one end of the discharge tube and positioned alongside one of the main electrodes. This is connected to the opposite main electrode by a second resistance inside the lamp's outer jacket. This second resistor is much larger than the first and takes the form of a length of coiled resistance wire sheathed in a C-shaped ceramic tube, which is mounted around the perimeter of the mica disc. The main lamp electrodes are of similar construction to the modern low pressure sodium lamps, but consist of an axial single coil of tungsten wire instead of the present beehive shape coil of triple-coiled wire. They are coated with the usual Barium-Strontium-Calcium carbonate emission mixture and are heated to thermionic emission temperature by the discharge itself. There is no preheating provision prior to lamp ignition. Their feedthroughs are pinch-sealed into each end of the discharge tube and sleeved with a layer of sodium-resistant borate glass, capped with a small magnesia ceramic tube to keep liquid sodium away from the glass-metal interface. 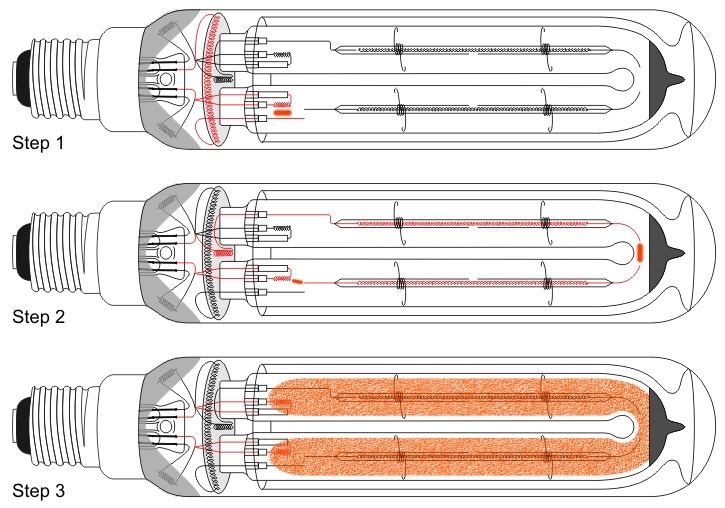 Thermal insulation of the discharge tube is provided by sealing it into a large diameter evacuated outer bulb. The insulation is improved by the presence of an oval-section glass tube which covers most of the length of the discharge tube. This functions in the same fashion as the more modern SOI/H type lamps and serves to reflect long-wavelength infrared radiation back onto the inner discharge tube. It is supported only at one end by fusing it to the crown of the outer bulb. A coating of platinum paint is applied to the outer surface of the U-bend region to provide additional heat reflection in this area which is not covered by the secondary glass tube. A barium-type getter is employed to maintain high vacuum in the outer bulb during lamp life, and it is especially interesting to note the construction of this getter which is surely one of the first applications of this device in an electric lamp. Modern barium getters consist of a barium-aluminium alloy pressed into a U-shaped nickel plated steel support, and they are heated by RF induction to trigger an exothermic reaction which evaporates the barium. However in these early sodium lamps the getters are heated electrically. The alloy is believed to be a barium-magnesium-aluminium powder that is packed into a small diameter ceramic tube. A coil of tungsten or molybdenum wire is wrapped around the tube, and two additional leading-in wires are provided in the stem of the lamp's outer jacket. These permit the getters to be electrically heated so as to evaporate their barium charge. Thereafter two of the wires in the stem are redundant, and the remaining two are connected to the lamp cap. Both lamp sizes are equipped with an E40 / GES Goliath Edison Screw cap, unusually formed in pure copper instead of the usual brass materials. This is likely on account of its large diameter skirt for connection to the glass bulb, which is easier to form in a more ductile metal. The cap requires only two electrical contacts in view of the fact that all starting means are contained within the discharge tube and its outer jacket. Upon application of the mains potential to the lamp terminals, the following sequence of events takes place for the 500 Hlm lamps. It is the same for the 300 Hlm variants except that step 1 does not occur owing to the omission of the starting probe in that design. The process is shown graphically in Figure S43. The easiest position for the discharge to strike is between the auxiliary probe electrode which is adjacent to one of the main electrodes. This ionises the gas filling and generates a small amount of light which lowers the ionisation potential of the gas in its vicinity. The discharge current is limited to a very low value by the high value of the first resistance. Owing to the great magnitude of the first resistance, the discharge promptly transfers to the easier route of breaking down between this main electrode and the end of the nearby insulated wire in that limb of the discharge tube. To complete the circuit, breakdown also occurs at the gap in the U-bend region of the discharge tube. The discharge current is able to increase somewhat after this step, owing to the lower value of the second resistor. It is unclear whether or not any heating effect of the tungsten filaments in the insulated tubes takes place during this stage, which might play some further role in lowering the striking voltage. At this moment with small discharges operating both at the U-bend and adjacent to one of the main electrodes, the gas filling becomes sufficiently conductive that a discharge is struck directly between the two main electrodes, its current being limited of course to a much higher value by the external choke that sets the main lamp current. Table S8 details the principle specifications of the double ended lamps. References: Technisch-wissenschaftliche Abhandlungen aus dem Osram-Konzern, V4 pp15-19 (1936) and Elektrische Gasentladungslampen, W. Uyterhoeven (Julius Springer, Berlin, 1938).